The Ocean Cluster for Experimental Architectures in Networks (OCEAN) enables networked systems research from low-level physical wiring to network protocols and applications, via a software defined networking (SDN)-capable network testbed. 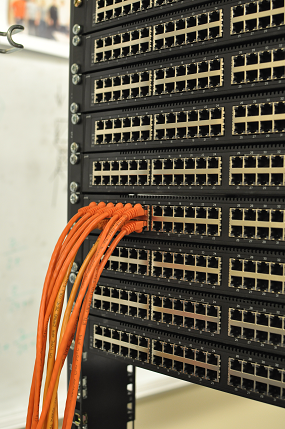 OCEAN is currently composed of 176 server ports and 676 switch ports, using Pica8 Pronto 3290 switches via TAM Networks, NIAGARA 32066 NICs from Interface Masters, and servers from Dell. Ahmed Khurshid, Xuan Zou, Wenxuan Zhou, Matthew Caesar, and P. Brighten Godfrey. VeriFlow: Verifying Network-Wide Invariants in Real Time. 10th USENIX Symposium on Networked Systems Design and Implementation (NSDI), April 2013. Ankit Singla, Chi-Yao Hong, Lucian Popa, and P. Brighten Godfrey. Jellyfish: Networking Data Centers Randomly. 9th USENIX Symposium on Networked Systems Design and Implementation (NSDI), April 2012. LIME is a system that consistently migrates virtual networks. LIME clones the data plane state to the new location, then incrementally migrates traffic sources, in a manner that is both consistent (transparent to applications running at endpoints and the network controller) and efficient (fast and low overhead). Soudeh Ghorbani, Cole Schlesinger, Matthew Monaco, Eric Keller, Matthew Caesar, Jennifer Rexford, and David Walker. Transparent, Live Migration of a Software-Defined Network. 5th ACM Symposium on Cloud Computing (SOCC), November 2014. OCEAN is built and operated by the research groups of Prof. Matthew Caesar and Prof. Brighten Godfrey. Major development of the testbed infrastructure was carried out by Kyle Jao, Devasia Manuel, Mo Dong, and Chi-Yao Hong. Web design by Xuan Zou. We gratefully acknowledge major funding from the National Science Foundation and DARPA, as well as contributions from Interface Masters, TAM Networks, and Pica8.